Bowling Green’s special teams are off to a solid start. The Falcons are eighth nationally in power-play conversions and tied for 15th in penalty killing entering this weekend’s Western Collegiate Hockey Association series at the University of Alaska (Fairbanks). “After eight games, we think our special teams are pretty good,” Falcon coach Chris Bergeron said. The Falcons are 5-2-1 overall and 3-1 in the WCHA, thanks to a power play that has scored eight times in 32 chances and a penalty-killing unit that has allowed just three goals in 29 attempts. “We have to find a way to stay at that level, game in and game out for the season,” Bergeron said. 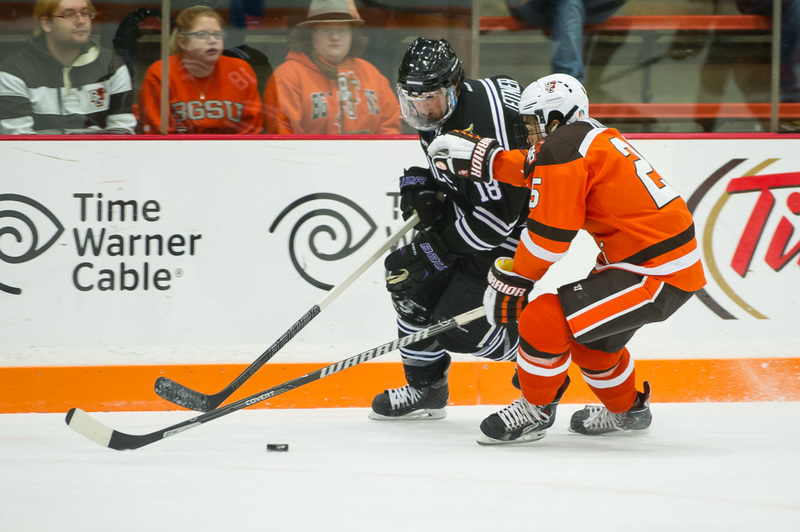 BG PK: The Falcons held a potent Minnesota State power play to no goals in six attempts last Saturday. DISCIPLINE: The Falcons are playing a disciplined game, averaging just 9.8 penalty minutes per game. “We want to focus on playing to the edge and not going over, and being disciplined in our game plan, and being disciplined in our actions,” Bergeron said. The discipline also is helping the BG penalty killing as the Falcons are facing just 3.625 opponents power plays per game. Alaska is the 10th-least penalized team in the country (9.0 mpg). FACEOFFS: The Falcons have won just 44.3 percent of their 560 faceoffs this season. BG has won more faceoffs than its opponents just once in eight games. “That’s not just on the centermen, that’s on all five guys contributing,” Bergeron said of the faceoff problems. “All we can do is to continue to work on it. It’s an issue. It’s a focal point in practice on a daily basis. BY CLASS: BG leads the nation in freshmen scoring. The Falcon freshmen have a national-best 12 goals and a national-best 27 points. The sophomore class has 11 goals and 15 assists, while the juniors have three goals and six assists, and the seniors have no goals and nine assists. SERIES: The Falcons are 23-26-6 against Alaska all-time, including a 10-14-3 record in Fairbanks. Last season, the Falcons posted a 3-0 win and a 1-1 tie against Alaska in the Ice Arena. The teams didn’t play in Fairbanks. NANOOKS: Alaska enters the series with records of 5-3 overall and 0-2 in the WCHA. The Nanooks have lost three straight. They were 6-1, 4-3 (overtime) losers at Bemidji State last weekend. The Nanooks were fifth in the WCHA coaches poll after tying BG for third in the league last season. “They’re really good, and I felt they were really good last year,” Bergeron said. “They’re a group that plays the same way all the time. They play a pretty honest, hard game. Entering the Bemidji series, the Nanooks were ranked 16th nationally. Alaska is seventh in the league in goals scored (2.62 per game), sixth in goals allowed (2.75). The Nanook power play is seventh in the league at 12.1 percent (4 of 33), and the Alaska penalty killing is sixth at 86.7 percent (26 of 30). Thirteen players have goals for UA this season, including senior left wing Garrick Perry (two goals, four assists) and junior center Tyler Morley (one goal, five assists). Morley was a third-team All-WCHA selection last season, totaling 17 goals and 17 assists in 34 games. Junior Colton Parayko is one of the league’s best defensemen. The 6-foot-5, 218-pounder was the WCHA’s defensive player of the year last season. Senior Sean Cahill (2.49 goals-against average, .926 save percentage) and sophomore Davis Jones (2.75 goals-against, .853 save percentage) each has started four games in goal. They split the starts at Bemidji.